15 Minute Manifestation review: I give a real review of this program after using it for three weeks and manifesting 38% trading cryptocurrencies. The 15 Minute Manifestation program is for you if you like listening to and enjoy soothing brainwave entrainment audios. It fits you if you want a system that’s easy to follow. The program only asks you to listen to one 15-minute audio a day for three weeks to get the results. It’s a simple system that can help you feel good and optimistic once you listen to the audios. However, this program isn’t for you if you don’t believe in the effectiveness of brainwave audios. If you’re the kind of person who can’t sit still (or don’t have the patience) while listening to a 15-minute audio, then you won’t like this program. The author doesn’t explain much science either – so if you want that, you may want to look at another program that offers what you want. Why Listen to 15 Minute Manifestation? How you work with your brain affects what you manifest in your life. If you leave your brain to do whatever it wants, it can trap you in thinking patterns that make you miserable. If you live your life only to survive, then your brain will put you in a survival mode where you can’t think creatively. If you want to manifest a great life, your brain has to think great thoughts. But if your brain has been conditioned to think in a survival mode, it will be difficult for you to think greatly. 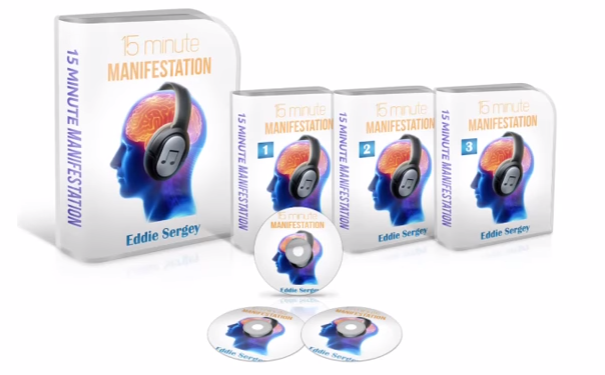 Here is where 15 Minute Manifestation comes in – it offers you a tool to put your brain into a creative thinking mode. 15 Minute Manifestation is a set of three audio files that contain brainwave entrainment sounds. The brainwave sounds consists of a Theta frequency wave, sounds from nature, and a subliminal guided meditation. Each audio file is slightly different from each other, as I will explain below. The Theta frequency is thought as the frequency where you can access your creative power. It’s the frequency that our brain has when you are in a deep sleep (or extremely relaxed like in meditation). Creativity can’t occur when we are stressed and alarmed. We need to ‘slow down’ our frequency to access the creative power to solve problems and plan the future. It’s possible to use a Theta frequency wave to ‘train’ your brain to vibrate at that frequency also. This process is called brainwave entrainment. 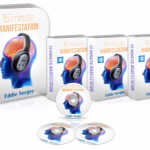 The 15 Minute Manifestation audios mainly use brainwave entrainment as the tool to help you access your unlimited problem-solving creative thinking. The audios also use sounds from nature to give a soothing, relaxed atmosphere. It also uses a guided meditation script that uses NLP (neuro-linguistic programming). NLP is a method of designing words to create effective communication. However, you can’t actively listen to the guided meditation – they are embedded subliminally (below what you can hear) in the audios. The combination of the Theta wave frequency, nature sounds, and NLP guided meditation is what makes the three audio files in this program. The three audios are designed to bring you from a state where your mind is random (no control) to one where your mind is creative. Your Natural State. This audio has the sound of flowing water; birds (or insects?) and animal calls in the distance; and an instrument with a low bell sound (like a Tibetan bowl). The purpose of this audio is to erase the negative beliefs you have about yourself and reveal the original, positive beliefs you are born with. Your New Story. This audio has the sound of ocean waves and bubbling water. The purpose is to write a new ‘story’ in your mind. The previous story is one where you believe in scarcity, and the new story is one where you believe in abundance. Moving Towards Abundance. This audio has the sound of a smooth musical hum, bells, and angelic choir voices. It’s my favorite track out of the three because it’s very calming and majestic. The purpose of this audio is to help you move into action after you have the correct belief in abundance. You can see that the audio files are a sequence. Listen to the first one to reveal your true, original good beliefs. Listen to the second one to see the abundant universe we live in. Listen to the third one to get the energy to move into action and manifest the good you want into your life. Other than the three audios, you get a Quick Start Guide PDF on how to use the audios. You also get the Manifestation Wizardry e-book that talks a little bit about the Law of Attraction. There are better books than this one if you want to learn about the Law of Attraction. You get a bonus audio titled Deep Sleep Now. I haven’t listened to this audio, so I can’t comment yet. The author of this program is Eddie Sergey. However, I suspect this name is a pen name (not the real name of the author). A quick Google search doesn’t show any picture of a man named Eddie Sergey. Although it’s a pen name, it doesn’t bother me. I am happy with the program as long as it works. The way I’ve been listening to the audios for the past three weeks is I listen to it in the morning (I use headphones to get the full benefit). When I listened to the first audio for the first time, I felt a sense of optimism about my life. It gave me a subtle boost of energy and confidence that what I am doing will get great results (especially money). I didn’t get a boost of energy the second time I listened to the audio. I wondered if the effects work for me only the first time. But I continued listening to the audio for a week, and it made me feel calm and ready to do what I needed to do that day. The audios made me feel very good that I looked forward to listening to them every day in the morning. I especially liked the audio for the third week. The first audio strengthened my belief in myself, but the third audio strengthened my belief in abundance. The design of the third audio is to help us move towards abundance, and I can say that it does work for me (although only in a subtle way). What works for me is to listen to the audio in isolation (without doing anything else). My mind thinks about problems and finds potential solutions while the audio is playing. I’ve thought about some subtle shifts to make in my life but also some ideas that I can try immediately. Most importantly, I realize how blessed I am with abundance, and it made me take some chances that have resulted in getting money (though only a small amount). The chance that I take is trading cryptocurrencies. You may know that it is a new and emerging market where people are making a fortune (in some cases, becoming millionaires). The audios help me to feel safe and confident enough to trade some amount of money in the market. In one case, I was able to get a 38% profit within a few hours. It’s not a big amount, but it’s enough to make me ecstatic. *If you use your smartphone to play the audio (like I do), I suggest turning off your WiFi connection. I was enjoying listening to the sounds when a message came in with a loud PING and interrupted me. I mostly like 15 Minute Manifestation, but there are some things I don’t like. What I like is that you can use a smartphone to play the audio and listen to them wherever you are (but not when you’re driving or operating heavy machinery as the disclaimer says). The audios sound very nice and do make me feel calm, relaxed, and ready to be creative. What I don’t like is the lack of science behind the audios. The companion e-books are short and give little information about how Theta brainwaves and guided meditation works. But then again it’s not about that – it’s about giving you a quick and easy tool to condition your brain, even if you don’t know anything about the science. You don’t end up spending much time to understand the science – you can just take the audios and listen to them immediately. The price of this program may not fit with everyone’s budget. There are similar brainwave entrainment audios that you can buy for a lower price than the ones in this program. You can even find videos on YouTube that play brainwave audios for several hours. But those audios have random themes. 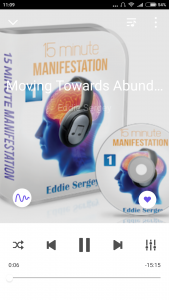 The good thing about this program is that the audio files are designed in a sequence to direct you to a state of abundance mindset. Does 15 Minute Manifestation work? I say, yes it does work. I did get some results after listening to the audios, but they aren’t massive results. Maybe it’s because I am only taking small steps while testing whether the brainwave entrainment truly works. I also missed a few days (weekends) where I didn’t listen to the audios because I was keeping my wife company. I plan to keep listening to the audios, one audio a day, and notice what changes happen in my mood, actions, and results. Is the program worth it? That question I can’t answer. I say it’s worth it – for me. The price is OK, and I can see myself listening to the audios in the future (not only a one-time thing). Is it worth it for you? If you already listen to brainwave entrainment audios, this program can give you a structure to follow. Following a structure can help you get your results fast. But if you are skeptical whether brainwave entrainment truly works or not, then it might not be worth it for you. If you can’t sit still or you don’t have the patience to listen to a 15-minute audio, then you may not like it either.